Lawmakers in both parties practice their steps in advance of the looming government hoedown. WASHINGTON—With legislators unable to reach an agreement on health care and other issues before the start of the new budget year, Washington insiders confirmed Monday that the United States is rapidly approaching a full-scale government hoedown. Already donning the bib overalls, Stetson hats, and festive gingham skirts that they will wear throughout what is expected to be a long and strenuous hoedown, legislators on both sides of the aisle told reporters that there is little chance of Democrats and Republicans negotiating a last-minute deal that would forestall a countrified barn burner the likes of which the federal government has never before seen. The full-blown hootenanny will officially commence at 12:01 a.m. Tuesday morning at the first sound of the fiddler’s reel, lawmakers have confirmed. 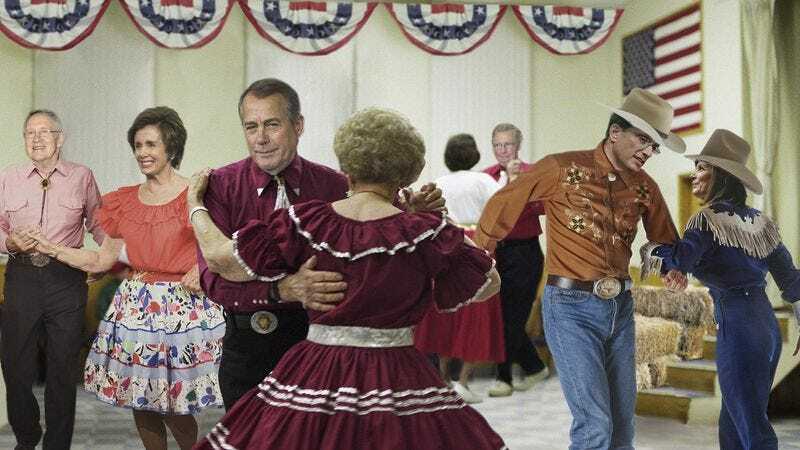 “Once midnight hits, all there will be left to do is take your partner by the hand and fall in step with the country band,” Boehner continued. According to congressional sources, the impending government hoedown could last well nigh until the crow calls, and government officials have already begun the process of raising barns and loading thousands of hay bales into the nation’s capital in preparation for a rousing display of square dancing, jigs, cake walks, and promenades, danced two-by-two. Washington observers have noted that the imminent government hoedown will be the first of its kind since the prolonged hoedown of 1995 and 1996 that forced legislators to curtsy and patter their way through a marathon 21 days of foot-stomping and country waltzes before at last coming to terms on a federal budget agreement. However, Democratic leaders have stated that tomorrow’s looming shindig could have been averted were it not for the lack of cooperation from across the aisle. “Woo-ee!” concurred House Minority Leader Nancy Pelosi, lifting her skirts and stepping out onto the hay-strewn Capitol rotunda. At press time, the Dow Jones Industrial Average had fallen by more than 120 points in advance of the federal government all joining hands and circling wide.